THE King of Rock n' Roll. Period. Full Stop. Last week was "Elvis Week" in Memphis. I don't know that because I follow Elvis. In fact, I really can't stand Elvis Presley's music. About as far as I can go down that road is listening to "Suspicious Minds," every so often. Nothing else really speaks to me. No, I know that last week was "Elvis Week" in Memphis because I have Sirius XM radio in my car and they were constantly playing advertisements for "Elvis Week." I don't really care about Elvis. But I do remember a fond trip to Memphis, where I went out of my way to avoid Graceland. The man driving the shuttle to my Enterprise Rent-a-Car really appreciated that. "He's so overblown," I remember him saying. Of course I don't take my stock in Elvis. 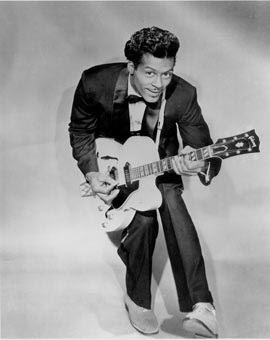 My vote for the King of Rock 'n Roll must, by all accounts, be Chuck Berry. He's the true King of Rock 'n Roll. I know, I know, I'm going to raise a lot of ire by saying that. But it's important to me. He was an amazing singer-songwriter who wrote the music he performed and didn't just take blindly steal other folks' music and slap a pretty white face on it to market to middle America. My favorite song by Chuck Berry isn't anything you'd normally expect, although I love me some "Johnny B. Goode," some "You Can't Catch Me," (stolen by John Lennon) and some "Sweet Little Sixteen" (stolen by the Beach Boys). My favorite, though, is something you don't hear played very often by Berry when you tune your radio dial. It's "Memphis, Tennessee." I grew up on the song. My mom and dad always listened to the local oldies radio station in the car. The Johnny Rivers version of "Memphis Tennessee" seemed to be a perennial mainstay. It would constantly be playing, nearly once every hour. It became a standard. Chuck wrote the lyrics and music, though, and the first recording was his 1959 B-side cut on the back side of his peppy "Back in the U.S.A." Berry wrote an amazing story. And important for the interpreter looking for a bit of inspiration, he used one of the basic tools of drama to do it. Listen to Chuck's version of the song. Go on, I'll wait. Listen all the way through and pretend that you've never heard it before. Maybe you haven't. Just listen to the lyrics and listen close. Who is this man? What does he want? And who is Marie? The story unfolds, bit by bit, piece by piece. Crucial tidbits of information fall into your lap as each line of the song rings out. "Her home is on the south side, high up on a ridge..."
The sorrow in his voice is clear and plain. You feel him; you feel his pain. It is the sorrow of lost true love. We find out that her mother broke this pure love up, destroyed their "happy home in Memphis, Tennessee." And you feel the heartache of the singer, missing the woman he so desperately loves and cares about, her tear-stained cheeks wishing him goodbye and "hurry home." But then at the end, the turn, and suddenly you realize this love affair you've discovered in the past two minutes wasn't a love between a man and a woman, but between a father and his daughter. It wasn't a deeply devoted sexual love, but a deeply devoted paternal love. And with just one line - "Marie is only 6 years old, Information, please." - the whole song suddenly shifts and changes meaning again. The song first gives one meaning to you, a true white-hot passionate love, and then at the end gives another powerful meaning, true fatherly devoted love. Two simultaneous meanings, just from the choice to leave out one crucial piece of information until the songs final strains. The technique isn't that hard. It's simply learning what not to include, what not to say and when not to say it. But then it is also the crucial skill of finding the exact moment to turn the wheel and reveal what you've withheld. Where does this all fit into the world of interpretation? Try to think of that one story where leaving out a crucial piece of information until a key moment adds that extra layer of meaning. The story of Jack Hopkins, janitor of Pennsylvania College is one where I've been using this technique for years. The complicated tale of a beloved janitor, jokingly called the "Vice-President" of the college in student view-books, chided for missing his daily duty of ringing the college bell for prayers and class, and owner of fine imported carpet and fancy mantle clocks, takes on an added dimension when I finally reveal the fact to audiences that Jack Hopkins was black. Withheld to the end, suddenly the students' joke, the chiding and the fact he owned fine goods all take on added and different meanings. Anyplace that there is inherent mystery in a story, where someone's identity is unknown, when the circumstances of their life make a moment even more meaningful, when someone turns out not to act as we might suspect, we don't need to throw the facts out right away. Even a famous case like Amos Humiston, Gettysburg's mystery soldier, can take on new magic by making sure that, when telling his tale, the first time the words, "Amos Humiston," escape your mouth they are the very last words of the story. 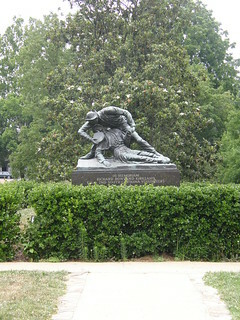 Imagine the story of Richard Kirkland at Fredericksburg, but only finding out at the very end of the tale that he was not offering water to his friends and comrades, but to the enemy instead. If all of this seems like a manufactured drama, yes, it is to some extent. But it's dramatic sentiment employed to help throw light on deep meaning. And that's the business that interpreters at Civil War sites are in: offering opportunities to gain meanings, not simply reciting cold, hard facts. So take a cue from the King of Rock n' Roll. Maybe it's time to try Chuck-Berry-style Interpretation.